Wayne Biddle • Penguin, 2012, 258 pp. 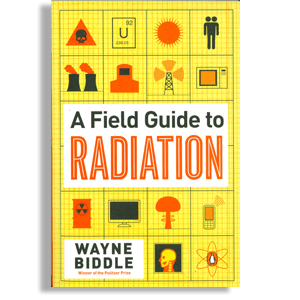 Couldn’t we use a field guide to the invisible radiation that surrounds us? In encyclopedic fashion (but without encyclopedic pedantry), journalist Wayne Biddle covers some key players and concepts of ionizing radiation. The bulk of the book is devoted to profiles of the radioactive isotopes ranging (literally) from actinium to zirconium. If this sounds boring, check the willing blindness to the dangers of radiation recounted in the entry on radium. Until about 1970, for example, 25,000 infants in Sweden were treated with radium — which is so radioactive that it glows — to destroy benign blood-vessel abnormalities called hemangiomas. Even those inured to the rampant use of the nerve toxin mercury in medicine may marvel that radium was used in “toothpaste, chocolate, hair tonic, suppositories, face creams…” This was long after Marie Curie, co-discoverer of radium, had died of cancer almost inevitably caused by radiation exposure. If only for its dissection of the confusing units that measure the biological effects of radiation, the book would deserve a place in every fallout shelter. But why does Biddle fail to explicitly distinguish electromagnetic radiation (visible light, radio waves, X-rays) from ionizing radiation? After all, it’s only the latter category — the alpha, beta and gamma particles emitted when atoms decay — that are his subject. Biddle contends that ionizing radiation is always harmful: “the basic postulate followed here is that there is no completely safe dose of radiation, even for natural ‘background’ radiation and medical diagnostic or therapeutic procedures.” He dismisses as “charlatans” those who conclude from studies of low-dose background radiation that not only have we evolved to tolerate this exposure, but that it’s actually healthy. More interesting would be an exploration of why it’s so hard to find any damage from extremely low-level exposures. There is also hyperbole: “Besides global warming, there is no more intractable problem for the planet’s future than man-made radiation.” Not over-population or the task of feeding 9 billion? Not protecting biodiversity or finding economic justice for the poorest billions? Sure, radiation has rendered uninhabitable large parts of Japan, and smaller parts of Ukraine. It’s invisible and it’s scary. Unfortunately, such overstatements cast doubt on what could be a highly useful book.